Garage door sensor - what's everyone here using? I use the EcoLink Zwave Tilt Sensor mentioned by JDRoberts above. 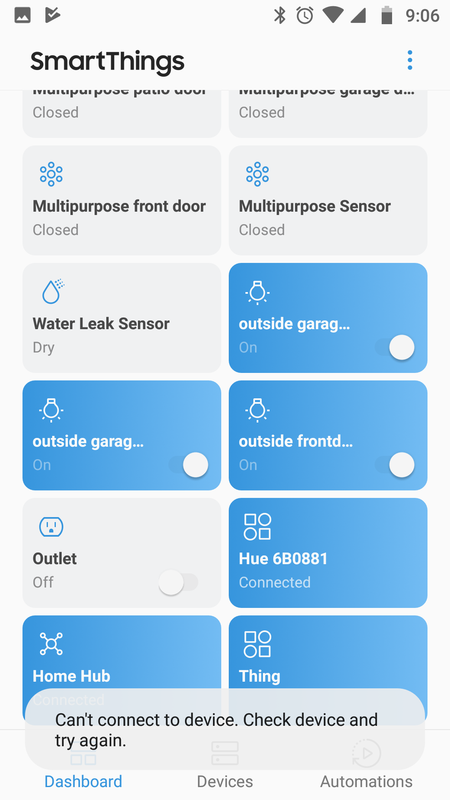 I am using the v3 multi sensor and I guess the NEW Smartthings app so the instruction I was directed to by Smartthings (https://support.smartthings.com/hc/en-us/articles/205463033-How-to-set-up-the-Samsung-SmartThings-Multipurpose-Sensor-as-a-garage-door-open-closed-sensor) could not be followed, this ability is one of the main reason I bought this system and need to know what I need to do to get this working. I recommend to look at my post above. That is one way but if using the Classic app it just works with the setting option, I just do not see any setting options in the NEW app. Just starting out, should I use the Classic app instead of the NEW app? yes, it is recommended that you use the Classic app at this point. I picked up a couple of these. You can view the SD recordings from the app. Although I can’t seem to figure out how to go to a particular time easily. I think the video is ok. Night vision worthless. I have one in the garage and It shows nothing but blackness at night. I tried the various settings for night vision and nothing really worked. But for $20 I guess I can’t expect too much. Thanks I will check into that - quick question about devices I have a device named Thing that uses the uses the same icon as the Phillip Hue hub but I can not connect to it, can not delete it, and have no clue when it was installed or for what purpose. I was setting up sensors today might it be something that I added by mistake or is it a link to the Classic app or my last guess might it be the remote light switch that came with my phillips hue? Kinda worried that a new device is there without me intending to add it. login to IDE at https://account.smartthings.com click on My Devices and locate that Thing and click on the name, see if it may offer more details there. Then edit the device and select the appropriate device handler for it. Also look in the Classic app, I bet you will be able to open it there. my last guess might it be the remote light switch that came with my phillips hue? did you connect it to the hue bridge or directly to the ST hub? if you connected it to the hue bridge, ST would not see it. I went into that page you said and clicked edit and it should it as a 2015 Samsung Smart TV so I deleted it lol, I guess I will find out if i was wrong soon enough. I have chamberlain garage door opener, I need a sensor. Any thoughts? Get the zwave plus unit. Longer range longer battery life. Plus its less expensive. I have been using normal “Door Sensor” on Garage door, which tells me when its Opened or Closed. Wanted to avoid using Tilt sensor.